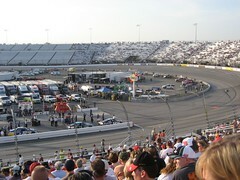 I went to my first NASCAR race last weekend. It was cool, but I’m not sure I liked it enough to be an avid fan. It seems like a whole lot of time, money, risk and energy to end up where you started. I was struck by something while I was there. What if we were that enthusiastic about Space exploration? My father’s generation (he was born in 1950) witnessed his parents generation spend a huge amount of time, money, risk and energy getting into space, to the moon, and sending spacecraft all over the solar system. All with computers and technology many of us have in our homes today. Somewhere between my fathers childhood and my children’s childhood, the enthusiasm has been replaced completely by other things. NASCAR is cool, but it’s about going in a circle REALLY REALLY fast. Sounds an awful lot like our current space program.